Thought I would do a little post on my current favourite hair products. I've been neglecting my hair a lot lately, so I thought it was time to have a look at the products that I know and love, so hopefully I start paying it a bit more attention! Schwarzkopf got2b Guardian Angel Heat Protection: I don't use heat on my hair very often, but when I do I know it's really important to use a heat protectant. I've tried lots in the past that I didn't really feel were doing anything, but I really like this one. It smells nice and makes my hair feel good, which is always a bonus. It's not a bad price either, and with Christmas coming up I know I'll be using more heated styling products, so important to make sure I look after my locks while I do! Alberto Balsam Shampoo (and conditioner): This is a bit of a strange one. I know beauty bloggers are probably 'supposed' to like all the expensive branded shampoos and conditioners, and as much as I am partial to a bit of John Frieda or James Brown haircare, Alberto Balsam will always remain my firm favourite. Number one - it's so cheap - at about £1 a bottle and there are pretty much always offers on. Number two - it smells so, so nice. The strawberries and cream one is divine, but I also adore the one pictured - so fresh and fruity. Finally, the main reason I buy it - it makes my hair feel so soft, and in good condition. I really don't see the point in spending loads on a shampoo/conditioner when I know this baby always delivers. I urge you to give it a go. Lee Stafford Argan Oil: After the huge craze over hair oils I knew I had to buy into it. However, I wasn't willing to part with the big bucks (I'm looking at you, Moroccon Oil) to give my hair a treat. Que Lee Stafford. If you've been reading my blog for quite a while you know I'm a big fan of Lee Stafford products, including the new 'Argan Oil'. Yes, it costs about £12/£13 for a tiny little tube but you don't need to use much and I know it makes a big difference to the condition of my hair. I think it's a great cheaper alternative to some of the bigger branded oils out there. Tigi S Factor Smoothing Lusterizer: I bought this after hearing Gem rave about it, and also learning that sleek-bobbed Jessie J also uses it. It's 'de-frizzer and tamer' which you can use on wet hair to make your hair really soft and smooth. It smells like strawberries and cream, and I love the effect it has on my hair. I got it on offer a while ago, Tigi tend to do offers every now and again so definitely worth a look if you don't want to pay full-price. I think it's around £11/£12 full-price. Batiste Dry Shampoo: Couldn't resist putting this in here, I'm sure you've all heard of it/tried it/bought countless bottles of it but there you go - it's a great product for those nasty in-between hair days, and I personally think it's great for creating volume and lift in my hair. 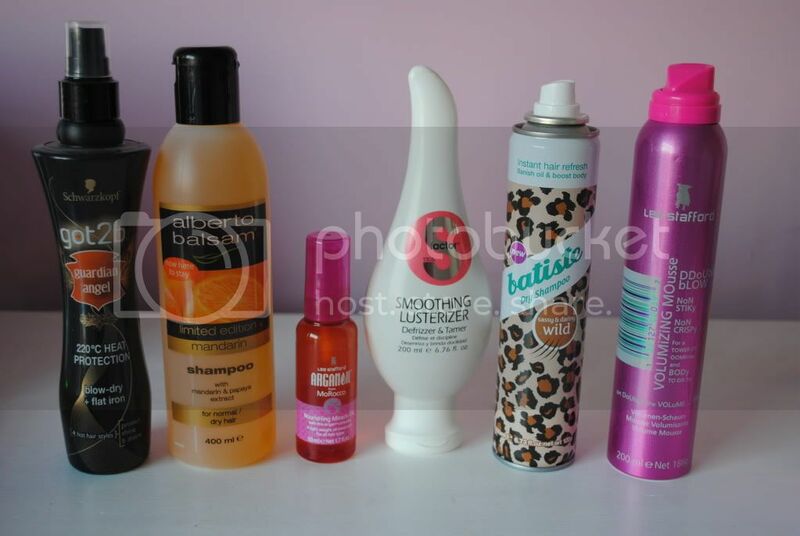 I don't think I could live without dry shampoo now, and Batiste do such a good range of different variations, you can't fault them really. Lee Stafford Double Blow Volumizing Mousse: I've used lots of volumizing mousses in the past, but this one is the one I always go back to. I love that it's called the 'double blow' - it basically means you can use it twice - when you hair is wet and then again after drying, to create a really big hair look. I love doing this and I've definitely got through three or four of these in the past. I will continue to buy them as they really do work.